Harry How/Getty ImagesCanelo Alvarez is set to be one of the leading figures in boxing for some time with his new $US365 million deal. Canelo Alvarez signed the biggest athlete deal in the history of sports, a $US365 million contract for his next five years of fights. Alvarez signed the deal with DAZN, a new sports streaming service that has signed some of the biggest names in boxing since HBO’s recent announcement that it was leaving the sport. The deal begins with Alvarez’s fight against England’s Rocky Fielding (27-1, 15 KOs), on December 15th at Madison Square Garden. 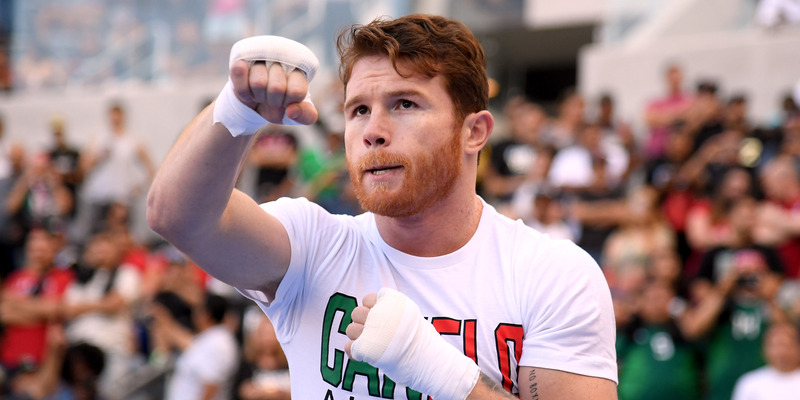 Canelo Alvarez has reportedly signed the richest deal in sports history – a $US365 million contract that will keep him as a central figure in boxing for years to come. Alvarez’s deal is with DAZN (pronounced “Da-Zone”), a new sports streaming service led by former ESPN president John Skipper. Alvarez will fight on the network at least ten times over the next five years, according to Lance Pugmire of the Los Angeles Times. The deal comes in the wake of HBO’s announcement that it would no longer be the home of boxing, opening the door for DAZN to swoop in and grab the rights to one of the biggest stars in the sport through 2023. With the $US365 million contract, Alvarez has locked in the richest athlete contract in the history of sports, surpassing Giancarlo Stanton’s 13-year, $US325 million deal signed in 2014. Alvarez is the headline fighter of Oscar De La Hoya’s Golden Boy Promotions, and according to ESPN’s Dan Rafael, the deal will also bring 10 “high-calibre fight nights” per year from Golden Boy that will stream live on DAZN beginning in early 2019. The deal has the potential to reshape how fight fans enjoy the sport – rather than paying close to $US80 for each pay-per-view, subscribing to DAZN for $US9.99 will bring boxing fans every Alvarez fight over the next five years. While Alvarez will no longer have a cut of pay-per-view buys due to the payment structure of DAZN, ESPN reports that he can still earn beyond the $US365 million based on subscription benchmarks as a part of the deal. Alvarez will kick off the deal with his super middleweight bout against England’s Rocky Fielding (27-1, 15 KOs), on December 15th at Madison Square Garden.